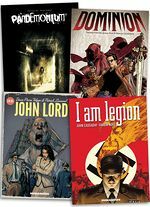 The best sale deals from Humanoids! Do you like Zombies? Do you like dark comedy? 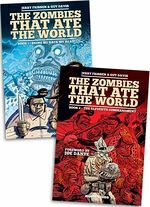 If so, buy one book from the acclaimed series THE ZOMBIES THAT ATE THE WORLD get the second one free! Book 1: Bring me back my Head! - As a zombie apocalypse engulfs America, we follow a group of friends on their journey to start a little business of their own…zombie catchers! Book 2: The Eleventh Commandement - This second volume gives us more wacky adventures from our favorite characters from both sides of the grave! Includes a foreword by Joe Dante (GREMLINS) as well as a bonus art section.